If you've not tasted an Applebees flapjack, they are great and now is your chance for an AMFAP (as many flapjacks as possible). 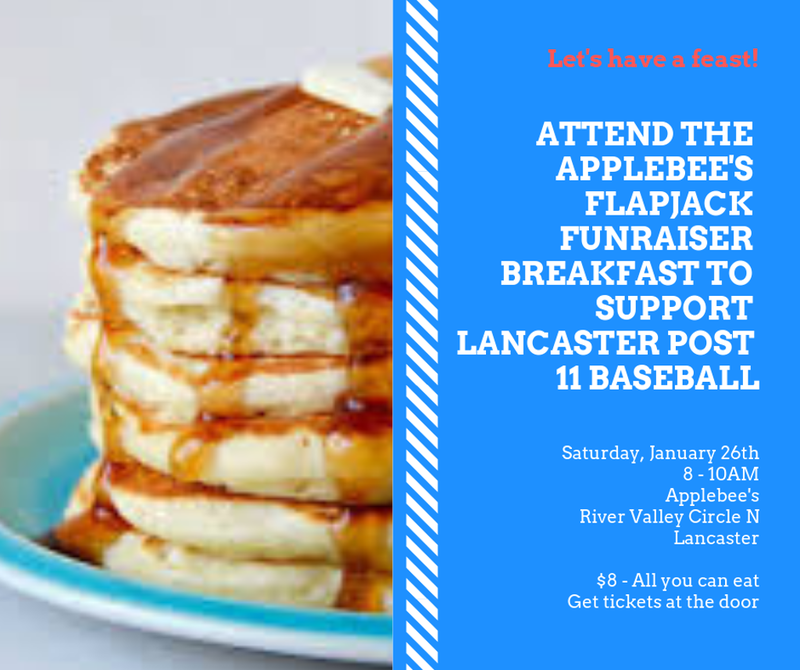 Applebees is hosting a flapjack fundraiser breakfast to support Lancaster Post 11 at their River Valley N, Lancaster, location on Saturday, January 26th, 8 - 10AM. The event is a fundraiser to help offset baseball tournament fees and hold our player costs to a minimum. Baseball can be expensive and Post 11 is working hard to keep the costs reasonable for our families. Tickets are $8 each for this all-you-can eat event and can be purchased in advance from a Lancaster Post 11 player or at the door the morning of the event. Not a big breakfast eater? You can still join the fun and support your Home Town Team by attending the event, enjoying some coffee, and watching a bunch of folks eat themselves into oblivion. Please join the fun, Saturday, January 26th, 8 - 10AM at Applebees in Lancaster to help raise funds for Lancaster Post 11 American Legion Baseball, your Home Town Team since 1949.